Yesterday four out of the 11 presidential candidates still called for the annulment of ongoing presidential- and parliament elections because of countrywide irregularities. They plead for ballot rigging. 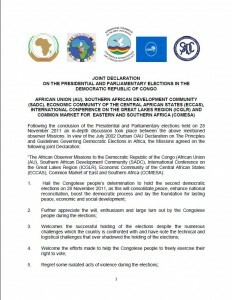 Today five observing African organizations published an official joint declaration wherein they called the elections a success for the DR Congo. Altogether they are five big organizations which signed the joint declaration: the African Union (AU), Southern African Development Community (SADC), Economic Community of the Central African States (ECCAS), International Conference on the Great Lakes Region (ICGLR) and Common Market for Eastern and Southern Africa (COMESA). logistical challenges that over shadowed the holding of the elections. be any dispute due legal processes should be pursued. While these official statements made publicly clear that the elections will not be annulled and they are seen as a success for the country, the oppositional candidates are still pleading for an annulment. Besides that, today some polling stations were opened again. Among others some were even opened for voters in Kinshasa. Electoral material still had not reached the stations and voters were sent away on Monday and yesterday. Some sources even talk about millions of voters who could not make use of their right to vote because of either missing material or already signed polling papers. In the meantime the election commission announced the announcement of the official election result on the sixth of December.